According to TMZ, Chester Bennington's death scene closely resembled that of his friend Chris Cornell. Law enforcement sources tell the gossip site that the LINKIN PARK singer was found hanging from a door separating his bedroom from his closet. The SOUNDGARDEN frontman died hanging from a hotel door separating the bedroom from the bathroom. In addition, Chester was found with a belt around his neck, just as Chris was found with an exercise band around his neck. TMZ's sources say there was a partially empty bottle of alcohol in the room where Chester died, but no evidence of drugs. Neither Chester nor Chris left a suicide note. 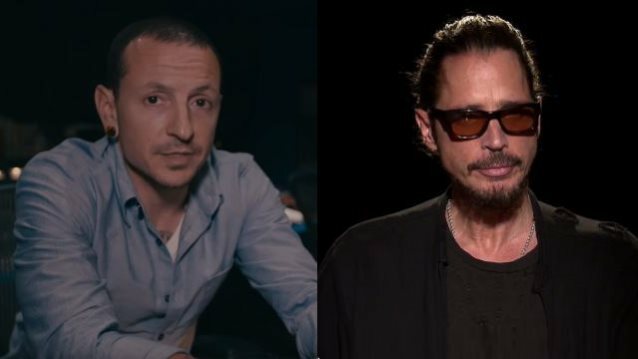 After Cornell committed suicide in May, Bennington sang at his funeral and also wrote a heartfelt message paying tribute to the SOUNDGARDEN frontman. In part, he wrote "I can't imagine a world without you in it." Bennington was also reportedly godfather to one of Cornell's children. Bennington's body was found on what would have been Cornell's 53rd birthday. "The Cornell family is overwhelmed by the heartbreaking news about Chester Bennington which tragically comes so soon after their family's own loss," said a Cornell family spokesperson. "They open up their loving arms to Chester's family and share in the sorrow with all those who loved him." "Just when I thought my heart couldn't break any more," Cornell's wife Vicky tweeted on Thursday on hearing of Bennington's death. Law enforcement sources tell TMZ that Bennington was home alone in Palos Verdes Estates in Los Angeles county at the time of the suicide. According to the site, his family was out of town. A housekeeper discovered Bennington's body, Palos Verdes Estates police Capt. Mark Velez told Daily Breeze.